Hello fellow crystal lovers! In this blog post I am going to answer a question I recently received. It also addresses other questions which seem to pop up on occasion, one of which I will answer in another post. 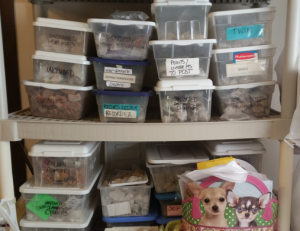 I have been purchasing tons of tumbles, quartz, and other minerals. Because I have a very destructive cat, I have to keep them stored in plastic craft boxes wrapped with bubble wrap or tissue. The fluorite seems to crack in shipment, or after I receive it. Do they mind being stored this way? I have probably 500 inexpensive stones ranging from agate into the various quartz types. The fluorite seems to break no matter what I do. Sometimes they jump from my hand or I drop another crystal on them accidentally, etc. I didn’t think of them as people, but I don’t know what else to do… there are simply too many to store open and love everyday. I am brand new at this and don’t know how to proceed. Thank you for your work. – K. S.
So, this actually breaks down into a couple of questions. 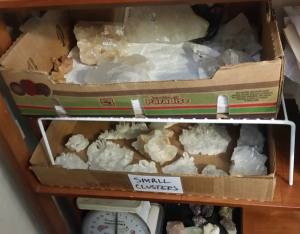 Number One: Is it OK to store your crystals away (rather than displaying them) and what is the best practice if you have a LARGE stone family? Do crystals mind being stored away, wrapped in cloth or tissue, bubble wrap or plastic? This is a great question and one I have asked my own Crystal Guide, Venus. The answer I received is that no, they don’t mind. They realize that there isn’t always room to display them all. Like the questioner, you may have mischievous pets that like to push them off shelves and/or you simply may not have enough shelf space on which to set them (this is the issue I have). We have our crystal family members on shelves all over the house, in baskets, bowls, jars and trinket boxes. I also have them stored “away” in several places. For instance, in the (large) wooden jewelry box pictured above, and stacked on shelves in plastic totes, boxes, bags and tins. Some of which have been there for years. As you might imagine, crystals are infinitely patient. Venus reminded me, with an obvious wink and characteristic tinkling laughter, that they are accustomed to living in very dark places for very long periods of time (meaning in the Earth). Being in our boxes and storage areas, even if for years in our lifetime, is but a blink in theirs. Ideally, and in a perfect world, you hear about keeping your stones wrapped in natural fabric (cotton, silk, etc), and this is great! I do this with stones with which I am currently working that are programmed toward a specific goal. Not so much with all my crystals. In truth, any way that you can store them is fine. If you have luxurious fabrics or fancy wooden boxes in which to keep your crystals, super! Conversely, if you have decidedly “unfancy” boxes, (plastic, wood, cardboard, whatever! ), that is equally fine. Bags, (fabric, plastic, paper)… also fine! Sometimes you simply can’t manage to follow best practice recommendations such as wrapping each stone in a special cloth. Oftentimes this just isn’t feasible. 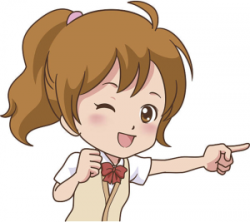 Believe me! If you are like me and have hundreds (thousands!?) of stones, you can’t always do this. As long as they are as safely secured as possible, and placed where EVER they are placed with an attitude of thanks and love, that’s perfect! Sometimes in your journey you may find it necessary that they don’t even live with you in your home, but are packed away in a storage unit. Sometimes it is necessary they live in buckets or boxes in sheds, garages or even outside. This, too, is OK! The point of this is NO GUILT. The Crystal People love us unconditionally. They are here to help us to love ourselves and they certainly aren’t here to judge us about how we have to store them. 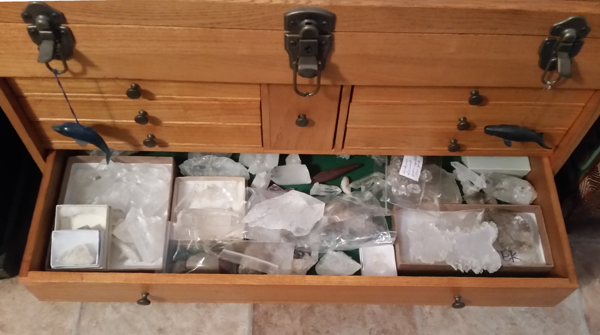 DON’T JUST PACK OR STORE YOUR CRYSTALS AWAY AND FORGET ALL ABOUT THEM. Unfortunately, sometimes out-of-sight can also mean out-of-mind. So, here’s the main caveat in all of this: However they are stored, wherever they are stored… always be mindful that they are there! Touch in with them periodically. You don’t even have to do this physically. Mentally is fine. I like to do this during the full moon. I touch in by mentally going to each area where they are stored and ask that they receive the energy of the full moon to recharge and rejuvenate them. I imagine them (in the box, bag, storage area) and say “HEY! I love you!” As long as they know that they are thought of, it keeps the energy exchange between you and your Crystal Family flowing. Number one: The Crystal People don’t mind how or where they are stored and number two: be mindful of your (stored) crystal/stone family and be sure to remember to touch base with them periodically! It’s as easy as that! Stay tuned for stones which are broken in our care. Do you have special ways that you store your Crystal Friends or do you have thoughts or comments on what I’ve suggested here? If so, please share below! Tagged crystals, how to, storing crystal. Bookmark the permalink. About crystal storage, Genn (Happy Birthday, by the way! ), I have a fun story to tell. I have a DT crystal that is set up as a lamp — I call him Buster. He is very particular about his surroundings, except he doesn’t care if he is dusty (he asked me if I didn’t think it was dusty underground). So a couple of years ago, we moved in with one of my sons to help him with expenses while he was in college. To my surprise, Buster allowed himself to be boxed for the move. Not to my surprise, when we got to our destination, his box was the first to be opened. My son’s girlfriend was putting him away in my new bedroom and he was telling her where he wanted to be placed and which direction he wanted to be facing. She decided to wash him off so he would be sparkly in his new digs. He told her, please stop, I do not want a mud bath. She told me all this a little later, I think she was still sort of shocked, because she had not been talked to by a crystal before – she asked me, does everyone in your family have a “Buster story”? I love all my crystals/stones/rocks, whether or not they are named. They are all special to me. 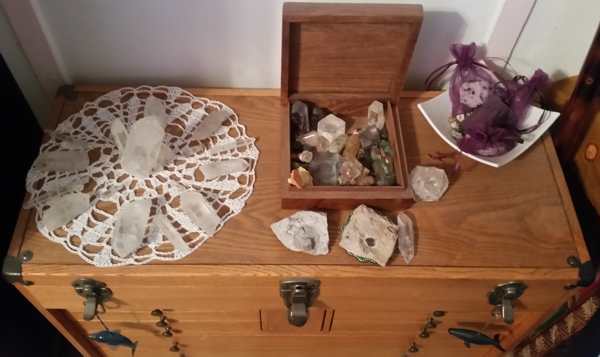 I also enjoy opening boxes in which I’ve packed away crystals for a time — getting reacquainted with them is a special time, each and every time. And, I ought to say that I have 2 cats; all the larger crystals in my living room are on the floor without exception, because my older cat will push them onto the floor when she wants to play with them and I feel it is best to avoid breakage. The younger cat always rearranges my crystal grids, I have become used to seeing it, she works on the grids several days a week, something like every 2 or 3 days. Cats and crystals. What a fun combination!